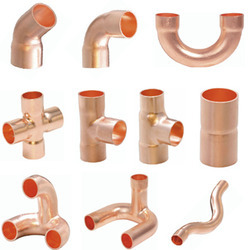 Copper pipe fittings have many purposes both in the home, in commercial buildings and various other situations. Some of the most popular purposes for copper fittings include water distribution systems, oxygen systems, chilled water mains, drainage and vent systems, heating systems and non-flammable medical-gas systems. There are major two different types: rigid copper fittings and flexible ones which can be divided into various other categories that all come in a range of sizes. Rigid copper pipe fittings are what are most commonly used when building new homes or buildings. They are much neater in appearance, however are more difficult to install than flexible ones. While flexible copper fittings are most commonly used for repair work on already installed rigid copper fittings. There are then different thicknesses: type M (thin), type L (medium-thickness) and type K (thick). The medium-thickness copper fitting is the most commonly used, particularly around the home. All copper fittings are put into one of three categories ¨C 1 to 3. Category one fittings are used for making bends and turns within pipes, while category two copper fittings are used for joining or branching copper pipes. Finally, category 3 copper fittings are used for couplings, slip couplings and more.